Goldfields Libraries have tonnes of resources for young adult members aged 12-18 to get their teeth into! Not a member? Easy - sign up here for free. If you are under 16 you just need permission from a parent or guardian. Goldfields Libraries offers a range of events and activities especially designed for young adults. Our programs are almost always free. YA highlights include: Songwriting with Darren Middleton from PowderFinger, Flash300 Flash Fiction Writing Competition, Library Lockin (pictured), Warhammer workshops, regular Minecraft sessions and Zine Studio self-publishing workshops. Check out our upcoming Young Adult events and activities. Are you into music? Secondary students from years 10 and up can get involved in Goldfields Connect - Music in Schools! Our first digital album was launched in 2015, with 10 tracks composed, performed and recorded in local secondary schools across the Goldfields region. There are also opportunities for live performances in our libraries. Bendigo Young Writers Association welcomes young people aged between 13-18 years who are interested in the art of writing. The group meets regularly for author visits, workshops, and to share a writing space and ideas with each other. View the current BYW program. 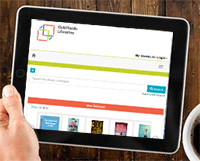 Goldfields Libraries eLibrary has loads of online resources available for members to use free of charge. Fun to use for leisure, and the perfect study companion! Many branches have free wifi access - simply connect your device and take a seat in a comfy armchair! Public computers with internet access are also available to use, along with printing and scanning services at a small fee. Grab a coffee or lunch at the Red Well Cafe inside Bendigo Library. Check out the facilities available at your local branch. With over 300,000 titles available, browsing our catalogue couldn't be easier with our new mobile and tablet friendly format. Find books, dvds, magazines and more to borrow and reserve, free with your library card! Browse the catalogue or download the catalogue app for your device. 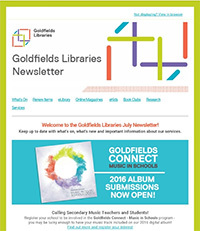 Several Goldfields Libraries are currently active on social media. Follow us to keep up with the latest news! Sign up to receive our monthly newsletter to your inbox to keep up with the latest events, activities and changes in our services. Suggestions? Goldfields Libraries Childrens and Youth Services would love to hear from you!